This antique German black cat ornament was originally a Christmas ornament, not meant for Halloween. How freaky is this antique German man face ornament. 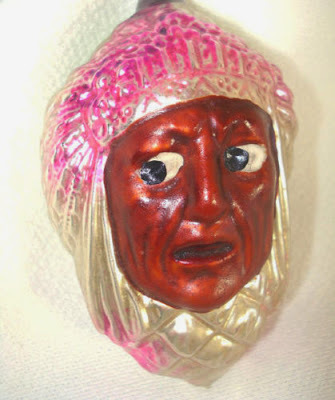 This vintage German Indian face ornament is just wrong on so many levels. No. Just.. No. Don't put this ornament on your tree, no matter what. Just look at it and move on. Obligatory scary clown ornament. I apologize. What in the? How is this monstrosity even remotely Little Red Riding Hood?